David and Faye Aspinal started their business in a converted cowshed… and now their stationery can be found in some of the most exclusive shopping emporia in the world. 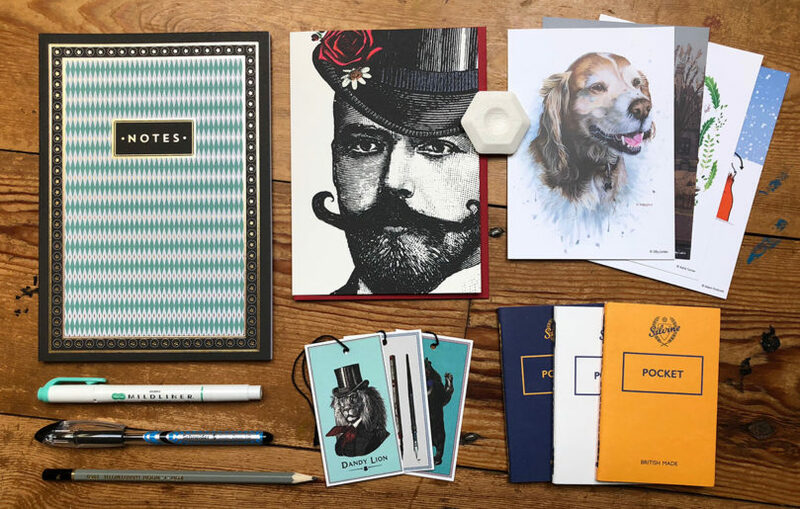 We love their notebooks, gift tags and cards… actually, we love ALL of their products! These are a true British icon in the world of notebooks. I can remember using the classic red ones at school (yes, I know, I’m old…) but this collection included the “Indie” pocket edition: Bumble Yellow, Blot Blue and Echo White. German brand Schneider produces pens with the smoothest writing action you’ll find and this Slider Basic XB looks pretty good too! Two pens for the price of one with this very popular Mildliner! As always, this collection included another a set of postcards featuring the work of talented young illustrators. This box sold out completely but there are other previous subscription boxes available in our shop.